MIAMI? Solar storms and eruptions on the surface of the sun are showing up inunprecedented detail in images and video from NASA's newest solar observatory. 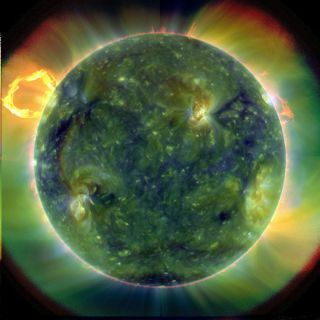 TheSolar Dynamics Observatory (SDO) is providing the most detailed observationsever collected about the sun, enabling scientists to better understand howseemingly small solar events can have large-scale effects on the Earth and itsinhabitants, such as knocking out power grids and GPS satellites. "Thesun is a major part of our everyday lives," said Dean Pesnell, SDO projectscientist at NASA's Goddard Space Flight Center in Greenbelt, Md. "Thebiggest thing about SDO is that it's enabling the prediction of spaceweather." Earlyfindings from the SolarDynamics Observatory (SDO) , presented today at the 216th meeting of theAmerican Astronomical Society in Miami, are already contributing to betterunderstanding of solar activity and the science of the sun's inner workings,project scientists said. "Evensmall events restructure large regions of the solar surface," said AlanTitle, principal investigator for SDO's Atmospheric Imaging Assembly at LockheedMartin Advanced Technology Center in Palo Alto, Calif. "It's been possibleto recognize the size of these regions because of the combination of spatial,temporal and area coverage provided by AIA." Shortlyafter AIA opened its doors, scientists observed a large eruptiveprominence on the sun's edge, which was followed by a filament eruption athird of the way across the sun's disk. AIAis capturing full-disk images in eight different temperature bands that span10,000 to 36 million degrees Fahrenheit. These capabilities allow scientists toobserve entire events that are very difficult to discern by examining a singletemperature band, at a slower rate, or over a more limited field of view. Thehigh-resolution, multi-temperature images enable scientists to zoom in andclosely examine the physics of the corona. "Althoughwe knew that these small-scale emergences affected regions locally ? at maybefive or 10 times their diameter ? we had not known that there was the potentialfor much larger-scale restructuring to occur," Title said. Byobserving these cascading effects in the corona, scientists will be able tobetter understand the cause and effect of solar activity. "Untilwe understand how these connections work and how fast they are, we won't reallyunderstand what really kicks off solar flares and coronal mass ejections,"Title explained. "For the first time, we'll be able to see theseconnections and understand the physics that is involved with this restructuringand the energy that is involved." Solarstorms produce disturbances in electromagnetic fields that can have disruptiveeffects on Earth. These storms have the potential to cause problems withsatellite navigation systems, radio communications and energy grids. Scientistswill use data from the SDO probe to help understand changes in the sun'smagnetic field and better predict solar flares. "We'rereceiving an enormous amount of information," Pesnell said. "We canlook all the way through the sun and tell you what's going on on the otherside. SDO gives us the ability to model the corona, and even watch the magneticfield coming from the inside, so we can see what's coming to Earth." SDOwas launched on Feb. 11 and the spacecraft's May 14 commissioning confirmedthat all three of its instruments had successfully passed an on-orbit checkout.This milestone marked the beginning of SDO's operating mission, meaning theinstruments are now producing science data streams. Thesolar observatory contains three instruments, including AIA, that take photographsof the sun every 10 seconds in eight wavelengths of light. The probe isable to record images with 10 times better resolution than an HD television. TheAIA instrument takes approximately 70,000 images a day, Pesnell said, and intotal, the observatory beams down 1.5 terabytes of data on a daily basis. "We'realready at five million images and counting," Pesnell said. "Withdata and images pouring in from SDO, solar scientists are poised to makediscoveries that will rewrite the books on how changes in solar activity have adirect effect on Earth. The observatory is working great, and it's just goingto get better."